warm stones and aroma therapy oil produce a massage that deeply relaxes the body and mind. group and individual programs to help you learn more about the different types of meditation, the health benefits of meditation for the body, mind and spirit and how to develop a mediation practice in your life. massage performed with the person fully clothed and seated in a specialized massage chair. Helps to relieve tension, stress from repetitive motion tasks, and increase productivity without ever having to leave the work site. programs which are designed to meet the specific health promotion needs of the company or group. These range from hour long to day long or series programs. an energy healing technique using assessment, direction and modulation of energy and grounding that helps to repattern the energy flow and assist in healing. gentle pressure applied to areas along the spine and the extremities which assists in the releasing of tension, tightness and body memories in the connective tissue assisting the body in balancing and healing. deep relaxation to help the person to heal, change old habits including smoking and excess weight. moderate to deep pressure with specific attention to "trigger points" along the muscles to release tension and pain, help the muscles to relax, and improve circulation to the muscles. massage to help the athlete, of any level, improve performance, training, endurance, and recovery. 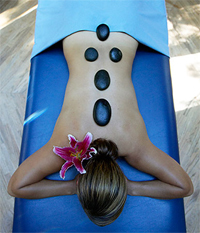 This can include pre-event massage, post-event massage and maintenance sports massage. gentle stroking along the entire lymphatic system and specific stretching exercises to help improve the flow of lymph and help decrease carpal tunnel symptoms. using the thumb and fingers to stimulate the reflex areas of the hand and/or foot that correspond to different parts of the body to help the body relax, increase circulation and assist the body in healing. massaging ranging from light to deep pressure to decrease stress, relax muscles, release tension and assist in improving circulation. massage synchronized to classical music to help you relax and re-energize. for all occasions. Purchase one for a specific service or amount. The perfect gift for everyone on your gift list. Design a package of several services or workshops for those interested in relaxation and improving their health and well-being. massage using blended aroma therapy oils to help increase relaxation, soothe tired achy muscles and enhance the effects of the massage. relaxing, flowing massage to help decrease stress, release tension from muscles and relax and refresh the body, mind and spirit.